Cloud based technology offers the ability to build, deploy and scale applications with ease; however, deploying to the cloud is only half of the battle. How cloud applications are monitored becomes a paramount concern with operations teams. When issues arise, teams and their monitoring systems must be able to detect, react, and rectify the situation. CPU, system memory, and disk space are three common indicators used to monitor applications, and are typically reported by the operating system. However, for Java applications – which we’ll be focusing on in this article – most solutions tap into JMX (Java Monitoring eXtensions) to monitor the Java Virtual Machine (JVM). For applications leveraging Java xPaaS middleware services on OpenShift, they have built-in functionality to provide the capabilities to monitor and manage their operation. Communication with applications – or in the case of xPaaS, an application server – is typically performed using JMX technology, and is generally accomplished using RMI (Remote Method Invocation). RMI technology is not well suited for cloud based technologies, neither is it suited for microservices architectures that focus on lightweight communication over HTTP; therefore, OpenShift xPaaS applications expose JMX operations through an HTTP bridge provided by the Jolokia project, where simple REST based methods and JSON based payloads provide a simplified and lightweight approach to remote application monitoring and management. In order to provide load balanced communication between multiple containers on OpenShift, exposed ports are typically mapped as service entries and can be further exposed through a route to provide access outside of the cluster. Most templates used with JBoss EAP only expose ports 8080 and 8443 as services to serve HTTP/HTTPS traffic. Since Jolokia provides a method to manage and monitor a single JVM, it would be impractical to load balance across multiple containers with the goal of targeting a single instance, and without a service and a corresponding route it would typically be impossible to access a resource that is only exposed to the internal pod network. OpenShift, however, provides the ability to proxy through the API server in order to access a pod inside the cluster (via underlying Kubernetes). The API server is the lifeblood of OpenShift. Everything – from nodes bringing themselves into the desired state to conform to etcd, to clients communicating with either the web console, or the command line tool – leverages the API server via RESTful invocations. As the diagram depicts (on the left hand side), traffic signified as Jolokia Proxy Traffic path will be the focus of the upcoming discussion. The right hand side of the diagram on the other hand, is the typical flow for application traffic – destined for externally exposed HTTP/HTTPS pod resources. This traffic is initially served by an integrated HAProxy router listening on ports 80 and 443. A service lookup is performed to determine an available endpoint on the pod network signifying a listening application container. The request is then finally routed to the address and port on the pod network. The majority of the application transport process is abstracted from the end user. 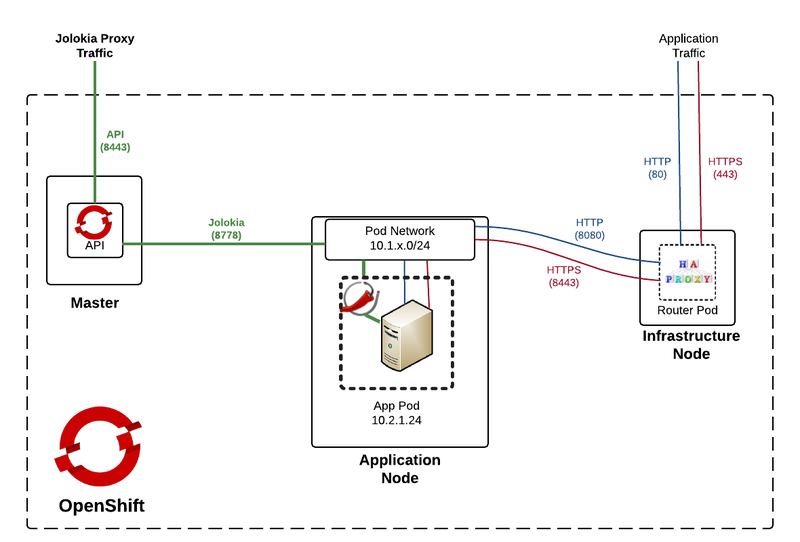 For traffic destined for Jolokia via the API proxy (left hand side), the flow begins by initiating a request to the OpenShift API on the master instance using port 8443. Based on input parameters, the request sent from the API to the pod network and ultimately to the destination pod and port. Let’s walk through each of these approaches. The template automatically creates the necessary objects in OpenShift, triggers an application build, and deploys the resulting image. Also included is the creation of a route for application traffic from resources outside the OpenShift cluster. This can all be validated by logging into the OpenShift web console at https://master_host:8443 and select the Jolokia project. OpenShift automatically generates a “master host” name based on application name, project name and default subdomain – this can be seen at the top of the page. Select the URL to open the Ticket Monster application in the browser; a successful response validates the application traffic path. With the application traffic path functional, focus can be shifted toward the true goal of obtaining information about the JVM resources from Jolokia through the API proxy. The application is deployed in the project named “jolokia”. As discussed previously, Jolokia exposes port 8778 for Java xPaaS images. Finally, Jolokia does utilize https communication, but the implementation is abstracted from the end user as it is only applicable for communication between API proxy and Jolokia. The end user needs to be concerned only with communicating to the API. The final step that is needed prior to invoking the API is to add the OAuth token for authentication. It can be obtained from the OpenShift CLI by running the <em>oc whoami –t command. Note: The –k flag is passed into the curl command as this specific OpenShift environment is using self signed certificates. To access useful JVM metrics, such as the amount of memory usage, the following URL can be used. The full set of requests and responses that can be sent to Jolokia can be found in the Jolokia product documentation. Given the ability to instantly access JVM metrics from running containers within OpenShift, the floodgates of opportunity are open to all the ways this data can be used. Everything from monitoring and reporting to alerting is on the table. Now that OpenShift is properly configured, navigate to the location containing the cloned project resources. In this directory, locate and open the index.html file (in a web browser). This file contains the application, which will attempt to communicate with all pods in a given project that expose Jolokia resources. Based on the located resources, it will display graphs of the current memory consumption, thread count, and HTTP web requests. The namespace (project) to search for resources. Using the material previously retrieved, enter the information into the input textboxes and press submit. Data will be returned from the pods on a 5 second interval to populate the graphs. In a separate browser tab or window, navigate once again to the ticketmonster application. Hit the refresh or the F5 key to simulate several requests. Return to the demo application to visualize the increase in the number of requests received. By being able to query JVM metrics from running Java applications in OpenShift, doors are opened to the potential ways that applications can be monitored and managed in a cloud environment. As we’ve seen in this article, Jolokia is a JMX-HTTP bridge giving an alternative to JSR-160 connectors, and it is useful for exposing JVM monitoring APIs via non-traditional protocols.